This forum is for questions / discussions regarding development of addons / tweaks for MediaMonkey. 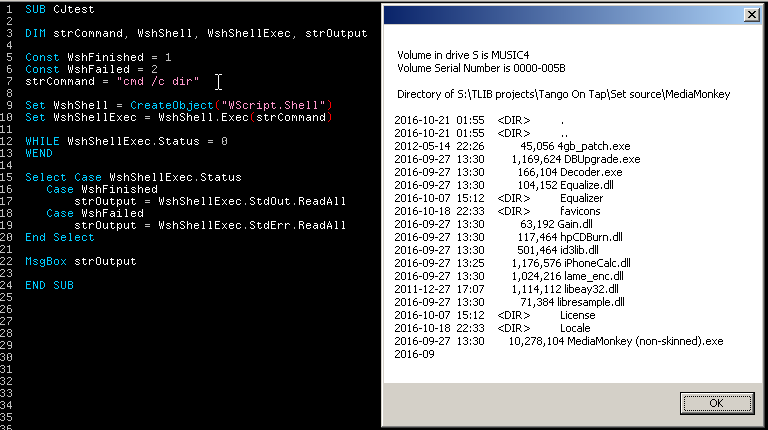 In cscript.exe and wscript.exe it works - the MsgBox shows command output. In MM, the MsgBox shows nothing. EDIT: In both cases, the final status is WshFinished, so the fail is in WshShellExec.StdOut.ReadAll . Does MM perhaps prang StdOut? 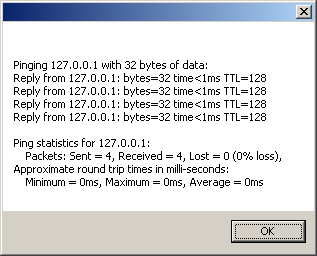 EXIT: With slow ping 127.0.0.1 replaced by fast cmd /c dir there's no fail: http://i.imgur.com/zFSNz32.png , perhaps suggesting the fail is time-sensitive. It isn't executed. The status is 1 - as expected. The .Exec is succeeding. The fail is of WshShellExec.StdOut.ReadAll. I just tried your code and it worked perfectly on my install. to check that the value being returned is a string. If it returns something other than a string then it could suggest where to look next. Also, do you have any error handling in your script or is the snippet you've posted the entire script? rivorson wrote: I just tried your code and it worked perfectly on my install. Wow! Good to know. Thanks. rivorson wrote: Also, do you have any error handling in your script or is the snippet you've posted the entire script? I execute it via a command key or from a menu command. The result is the same. A zero-length String. I'd love to know how you are executing it such that it works. I'm using Win 7 64-bit. I executed mine from the MM script menu, same as yours but I don't have a keyboard shortcut assigned. I'm running Windows 10 Pro 64 bit. It could possibly be something in the wscript.exe version, found in C:\Windows\System32. I have version 5.812.10240.16384. I don't think the version would make a difference for this particular command but I can't think of anything else to try. rivorson wrote: I executed mine from the MM script menu, same as yours but I don't have a keyboard shortcut assigned. Here with key assignment removed, the problem remains. Likewise with ScriptType changed to 0.
rivorson wrote: I'm running Windows 10 Pro 64 bit. It could possibly be something in the wscript.exe version, found in C:\Windows\System32. I have version 5.812.10240.16384. I don't think the version would make a difference for this particular command but I can't think of anything else to try. I have 5.8.7600.16385. On Windows 7 64-bit. MM build is latest - 1813. My MM is also 1813 but I don't think MM is the problem. Seems more likely to me that there's something causing the Windows Scripting Host to return the empty string. Have you tried reading the output line by line instead of ReadAll? I put the linecount in for extra diagnosis so you can see if you get a single empty line or multiple empty lines. rivorson wrote: My MM is also 1813 but I don't think MM is the problem. Seems more likely to me that there's something causing the Windows Scripting Host to return the empty string. 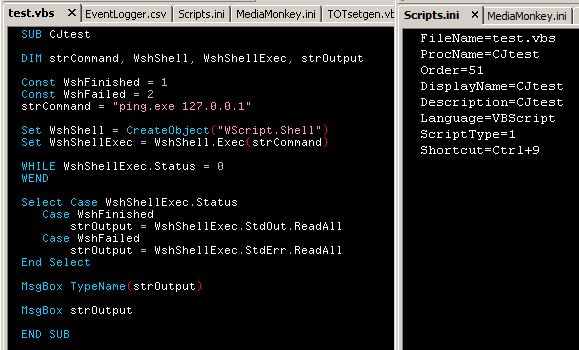 When I take that code out of the SUB and give it to cscript.exe or wscript.exe, I get the same. So the WshShellExec.Stdout just isn't giving any result. The only thing left that I can suggest is creating a fresh portable install of MM to see if it does the same. You could also try the portable install on another computer if you have access to one to see if the problem is specific to your computer. rivorson wrote: The only thing left that I can suggest is creating a fresh portable install of MM to see if it does the same. "When I take that code out of the SUB and give it to cscript.exe or wscript.exe, I get the same." suggest you were right in suggesting this is not down to MM. Or does cscript.exe or wscript.exe give different there? Just wondering if anyone tried RUN instead of exec and what echo report back? Peke wrote: and what echo report back? I don't understand this. Could you clarify? Whops. Please ignore that. I inserted your added code WITHOUT removing the ReadAll, so the results are invalid. I take this to confirm that the problem is specific to MM, and is not specific to ReadAll. Further info: With the test command changed to cmd /c dir, there's no fail. Note added to OP.